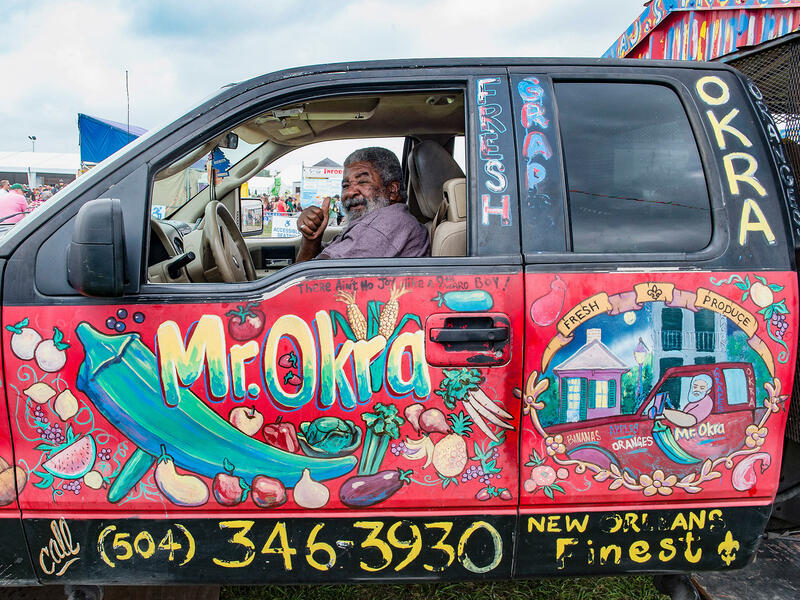 During the 2017 New Orleans Jazz & Heritage Festival last April, Mr. Okra drove his iconic produce truck and called out to customers. "My name is Arthur James Robinson but they call me Mr. Okra," Robinson told me when I encountered his colorful produce wagon on a reporting trip in 2013. Neighbors would pick fresh vegetables and fruit from boxes stacked in the back of his truck. It was painted with images of produce and declared "Be Nice or Leave," the slogan painted by New Orleans folk artist Dr. Bob. Robinson had been selling produce on the streets of New Orleans since he was a teenager, working with his father. "You name it, I sell it," he told me on a route through the Bywater neighborhood. Robinson was such a fixture in the city that a photograph of him is part of the Culture and Cuisine exhibition at the Smithsonian's National Museum of African American History and Culture. He was among Southern Living magazine's "Southerners of the Year" in 2017. And he's also the subject of a children's book and a short film. When local news outlets reported that Robinson died Thursday at the age of 75, many customers took to social media to pay tribute. Robinson will not soon be forgotten. In fact, his iconic voice will live on. Ian McNulty, the food writer for the Advocate, reports the Louisiana Children's Museum plans a kid-sized replica of Mr. Okra's truck and recordings of his songs will be part of a new exhibit.